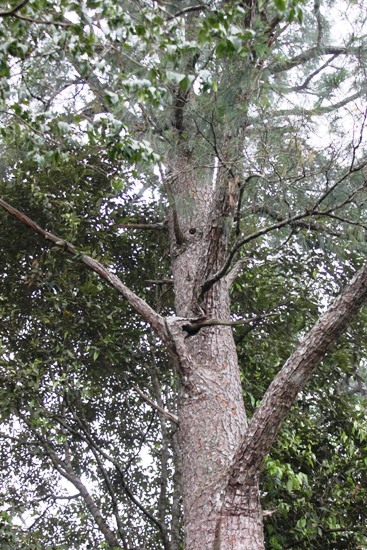 The third among world’s five-needle pine species, after Pinus dalatensis and Pinus kwangtungensis, has been recorded for Vietnam in Xuan Nha Nature Reserve, Son La province. The white pine with large cones and wingless seeds was preliminarily identified as Pinus armandii. Its current conservation status is assessed as Critically Endangered (CR), requiring immediate protection. In addition to conservation values, this pine species also has potential uses in forest plantation for timber and for edible seeds. Forest habitat in Xuan Nha Nature Reserve. In bonsai art five-needle pines are considered as a symbol of strength and beauty due to its neat and solid looking trunk, with fresh green coniferous foliage harmoniously arranged on the branches. The five-needle pines are used to create many bonsai shapes, ranging from simple to complex, from modest to sophisticated, but wherever the tree always reserves its noble but very lively contemplation. Five-needle pines have been on top of dream collections of many Vietnamese bonsai growers. Some enthusiasts spend lots of money trying to get a specimen of the five-needle pine from China or Japan in their bonsai collection. However, these pines cannot tolerate climate and soil conditions in lowland of Vietnam. Therefore, many bonsai lovers eventually lost their trees after one or two years of unsuccessful cultivation. However, not many bonsai growers know that there are five-needle pines growing naturally in forests of Vietnam. Vietnam has not one but three species of five-needle pines. Two species Pinus dalatensis and Pinus kwangtungensis have been known since the French colonial time. In January 2013, a research team of PanNature discovered a population of another five-needle pine species in Xuan Nha Nature Reserve in Son La province. The pine species grows relatively straight with height from15 – 25 m and diameter at breast level reaches 0.8 m.
Collection of specimens of the five-needle pine. Different from Pinus kwangtungensis, this new pine has leaf bundles with very long needles of 12 – 24 cm, drooping down. 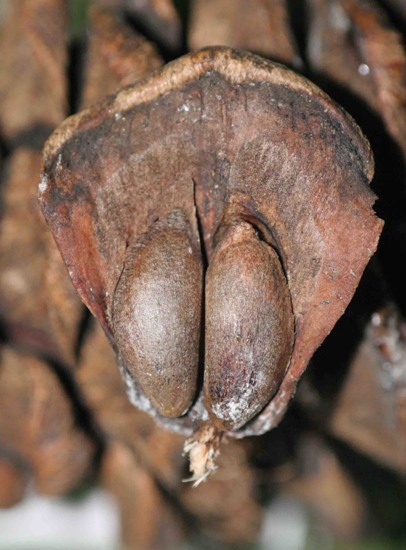 Seed cones are quite large with length of 7-10 cm and diameter of 5-7 cm, containing many big seeds of 0.5 x 1 cm in average size. Particularly, seeds of this species do not have real wings. The population of the five-needle pine in Xuan Nha Nature Reserve grows in a nearly pure stand with total estimated number of mature trees around 200 individuals in an area of approximately 6 square km. This is a mountainous area of altitude from 900 to 1,200 m on clay soil developing on mother sandy stones. Mature individuals of this pine distribute quite evenly in the area. Regenerating saplings are very rare. Only 3 young seedlings (two year old) were observed. 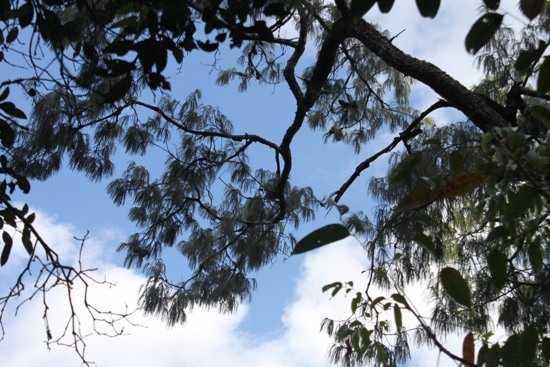 Under the pine canopy there is a layer of shrubs and small trees of 2-3 m high, including species of families Theaceae, Lauraceae and dense clumps of small bamboos and tall grasses. In lower elevation down of the pine ridge, there are primary evergreen forests with occurrence of other conifer species such as Podocarpus neriifolius and Dacrycarpus imbricatus. On the cliffs of the revealed sand stones an interesting slipper orchid has been found. The leaves of the orchid are of white-green color with dark-green spots. Although its flowers were not observed, the orchid is premilinarily identified as Paphiopedilum appletonianum, an orchid species normally found in the Central Highland. 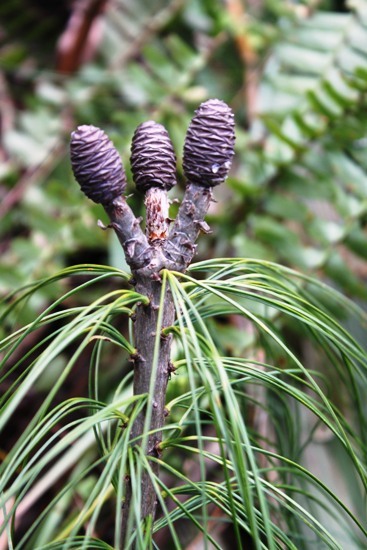 The newly discovered five-needle pine species has many distinctive characteristics as compare to the known Pinus dalatensis and Pinus kwangtungensis. Based on the collected specimens and existing information, it has been preliminary identified by taxonomic experts as Pinus armandii, or the Chinese White Pine. In China, this pine species distributes from Southern Shandong to Southern Gansu in the West and to Southern Yunnan in the South, with some isolated populations in Anhui and Taiwan. The species is also found in the North of Myanmar. The new population of Pinus armandii found in Xuan Nha Nature Reserve therefore is the furthest distribution in the South of this species and is separated from the nearest population in Yunnan. This feature suggests that the pine in Xuan Nha Nature Reserve may belong to another variety rather than the white pine in China. Additional study should be done to clarify the taxonomic position of this pine species. Chinese White Pine is named after the French missionaries and naturalist Armand David, who was the first one introduced the tree into Europe. The species now is planted as a horticultural tree in parks and gardens in Europe and Northern America. The pine also plays important role in forest plantation in some areas in China. Seeds of this pine are collected and sold as edible food. Wood of this species is used in general construction. The population of five-needle pine in Xuan Nha Nature Reserve is the only known population of this species in Vietnam. Since it has a limited number of individuals, small area of occurrence, low regeneration ability due to wingless seeds, we recommend that the pine should be categorized as Critically Endangered (CR) in Vietnam. Pinus armandii should be included in the national list of endangered species for strict protection for its valuable genetic resource. At the same time, research on propagation and cultivation of the pine as a new potential tree for forest plantation in the Northwestern region should also be considered. 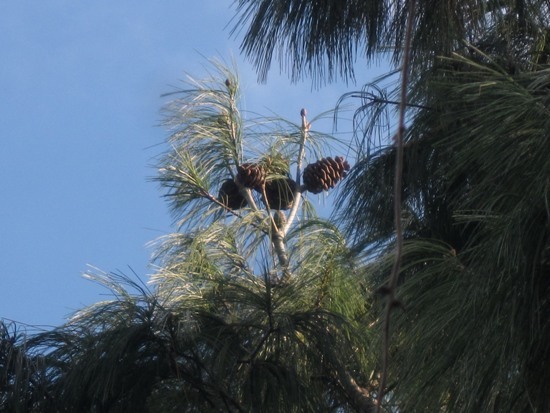 Below are some photos of the five-needle pine in Xuan Nha Nature Reserve. Photo credit should be given to Minh Xuan/PanNature if used. 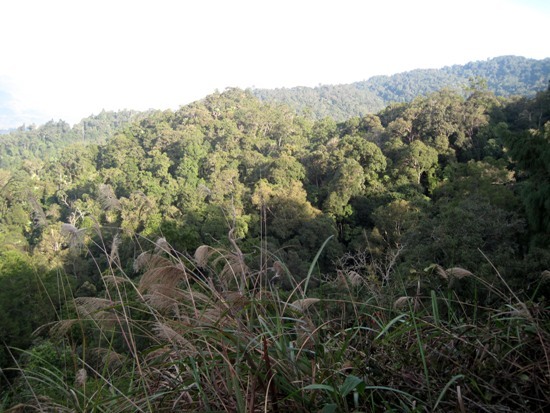 During a field survey in the middle of December 2012 PanNature’s research team discovered an area near Pha Luong peak in Xuan Nha Nature Reserve (Son La province) where several precious and rare coniferous tree species are thriving. These conifers include Plum Yew (Cephalotaxus mannii) and two species of Catkin Yew (Amentotaxus). The investigation in Xuan Nha Reserve is a part of the project “Conservation of conifer tree species in Hoa Binh – Son La limestone corridor” implemented by PanNature and supported by the Rufford Small Grants. The forest area is about 120 hectares, locating in the southwest slope of Pha Luong mountain (at altitude 1,580 -1,635 m) in the boundary of Cot Moc village (Tan Xuan commune, Moc Chau district, Son La province) and adjacent to Xam Neua district (Lao PDR). There is a mixed subtropical mountainous forest grown on sandstone. Three rare conifer species were found in this area, including Cephalotaxus mannii, Amentotaxus argotaenia and Amentotaxus yunnanensis. The population of Cephalotaxus mannii in Pha Luong consists of 10 mature trees. Some of them reach 25m in height and 0.8 m in diameter. Trees growing on rock cliffs of the mountain are usually smaller, with main stems broken and many side branchlets. The team also found dozens of young seedlings of Cephalotaxus mannii well regenerating on moist humus layer of the forest. Bark of Cephalotaxus mannii trees has brown-red color, peeling away into thin layers. The upper side of its leaves is dark green while the underside has white stomatal bands. Cephalotaxus mannii is scatteredly distributed in Vietnam. Its current conservation status is listed as Vulnerable (VU) in both Vietnam Red Data Book (2007) and IUCN Red List. The species is also included in the Appendix IIA of the Decree 32 of Government of Vietnam on Management of Endangered, Precious, and Rare Species of Wild Plants and Animals. In the same area where the population of Cephalotaxus grows, the research team also found a big tree of Amentotaxus yunnanensis. It has a large trunk, with diameter 85 cm and height approximate 30 m. Amentotaxus yunnanensis is a very rare conifer listed as endangered (EN) in the IUCN Red List. It is normally found on limestone areas in Ha Giang, Lao Cai, Bac Kan, Tuyen Quang provinces. 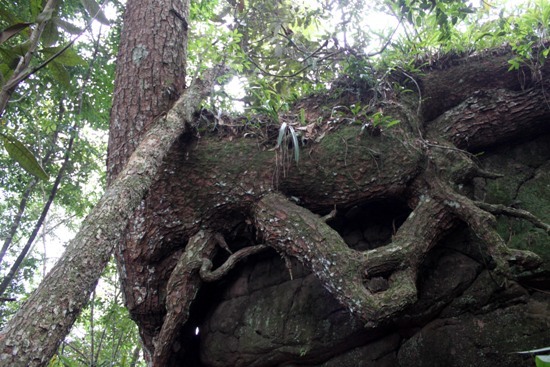 In Pha Luong, the tree just grows on the sandstone-derived clay soil and has an unusual large size. 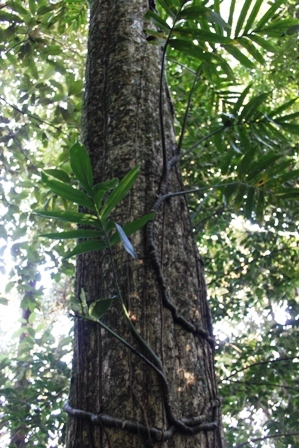 In the past, a similar tree of Amentotaxus yunnanensis with the same size was found in Pu Luong Nature Reserve (Thanh Hoa province). 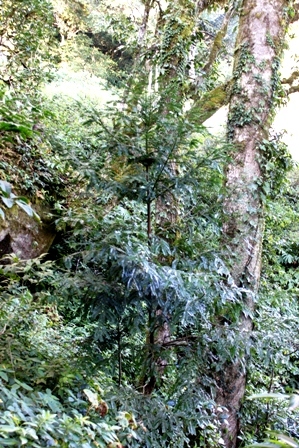 Another species of Amentotaxus was found in Pha Luong area. The conifer is identified as Amentotaxus argotaenia. This species has two white stomata bands in the underside of its leaves, which are narrower than the ones of Amentotaxus yunnanensis. 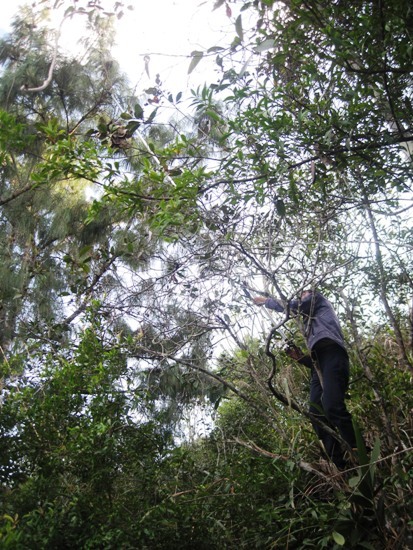 The research team found only two young trees of 3-4 m height in the area. In Vietnam Amentotaxus argotaenia can be found in several areas but all the populations is relatively small. Its conservation status is ranked as Vulnerable (VU) in the IUCN Red List of threatened species. Amentotaxus yunannensis with diameter of the trunk of 85 cm. The existence of Plum and Catkin Yews on Pha Luong mountain has significant implications for research, conservation and biodiversity values of Xuan Nha Nature Reserve. Even though the forest area is not yet affected by human activities thanks to its remoteness, small population size, narrow area of occurrence, difficult natural regeneration and forest fires are all current threats to survival of these remaining conifer populations. In additionto the above-mentioned species, the research team also observed occurrence of other conifers in adjacent areas such as Keteleeria evelyniana, Dacrycarpus imbricatus and Podocarpus neriifolius. These findings suggest further research and conservation work to explore and protect many potential biodiversity values of Xuan Nha Nature Reserve.